Elevation Design – Sparkly turqouise sequined dress with white lace overlay pops on stage. 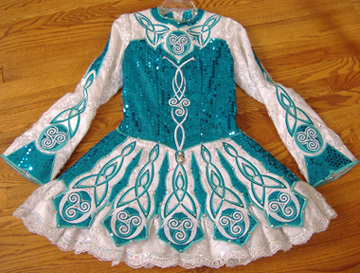 Dress is elegant and memorable with detailed Celtic embroidery. White ruffled tulle underskirt. Dress is in very good condition, always worn with dress shields and from a smoke-free home. Matching bloomers, headband and headpiece included. Dress is located in central NJ, USA. Photos don’t do the dress justice–it is much more sparkly and fancy in person. Asking Price: $US775. Shipping costs not included. Will accept returns and refund the cost of the dress, buyer to pay all shipping costs.